The Company is the leader in Real Estate field. Several Real Estate Agents work with the client company on commission sharing basis. The client has been interested in developing the application for meeting all their back office application needs. Transactions are linked to Agents, Byers and Sellers of the property. STPL has been in the Real Estate domain applications for quite some time. Client has been making use of an application which is local network based. Client required STPL to rebuild the application to migrate from MS Access based application to a web enabled application running on SQL Server Data base and Dot Net Technologies. Changing database files for selecting different regions. 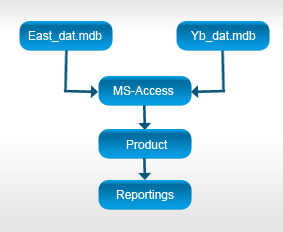 The main functionality of the Application is that we this application have two types of database files one is east_dat and other is Yb_dat. East_dat data files contain five different offices and Yb_dat data files contain three different offices, If a user want to generate the report of a particular Real Estate Agent of office present to other database files then user have to select the change company tab, select and change the other data files name. Application also provides the functionality of Reports generation according to monthly and yearly basis. It also provides the facility to save the reports in MS-Excel and MS-Word format. As described earlier this application currently is having the functionality of creating Reports for containing a Incomes, Profits, losses, listings & selling etc details done on different Real Estate Agents by the selected different offices according to their monthly or yearly bases. Different Modules generates different type of reports. Each report contain the total no active and inactive sellers and Buyers of a particular offices. These reports provided the agent (Sellers or Buyers) Information’s according to their Period of monthly or yearly bases. Application Provides the Real Estate agents information related to their Incomes, Profits, losses, listings & selling etc of the Seller or Buyers of Real Estate, Inc. The database model was real challenging and extendable. All the modules are fully integrated and are sharing the same Databases. This Application provides Centralized Data Base System. Real Ledger Application used MS-Access Database. These data files contain the information of sellers and Buyers of different locations. This Application is divided in different main modules. All the modules are fully integrated and are sharing the same Databases. The client required to capture the Real Estate listing information directly from the front office application and integrate these into the new application, without needing to be re-entered. The basic flow of the Module is shown in the diagram below. STPL designed and developed the innovative solution to meet all the requirements of the client. This application manages two different types of database, one for Selling and another for Listing. One of these databases is in Ms-access format and other is in text file format. This application contains the utility program which can transfer MS-access database and text file into SQL Server. Scripts were written to download the Ms Access database files (selling database) from the ftp server with the help of file-zilla and paste these database files in LAN development server, then run the utility Program for transferring the ms-access database(selling database) to SQL server. Likewise to convert text file data (Listing data) into SQL server, download the text files from ftp server. The text file are opened in WordPad and uploaded.